Imagine the feeling of dry sand pouring through your fingers, or packing wet, hard sand into a bucket, or wet sand dripping from your fingertips. 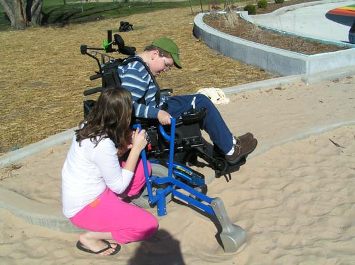 Sand play delights the senses, but sand play is far more than simply pleasurable for young children. This type of sensory play is very important for the development of young children. 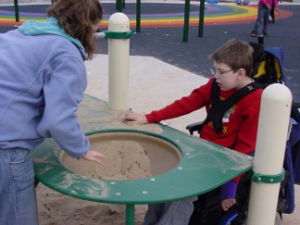 Sand play gives children a chance to explore science concepts like wet and dry, volume, pouring, and sifting in a hands-on way. 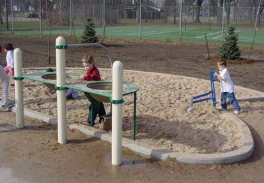 All children are given this opportunity at KASH playground. 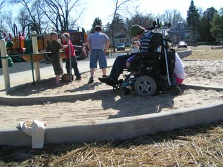 A sand table at wheelchair height is positioned for easy access and the sand digger has sidewalk access for wheelchair users.